A visit to the lowcountry these days or any seafood restaurant worth its weight wouldn’t be complete without a taste of Fried Green Tomatoes. Once considered a poor man’s food, today the dish is served with fancy dipping sauces all over the South and prices range anywhere from $7 for an appetizer to $16 or more for an entrée. For me, the Fried Green Tomato symbolizes stories of days gone by and aside from their crunchy, salty exterior, it’s the farm to table concept and nostalgia factor that make them so appealing. It’s been said that Fried Green Tomatoes came about because when there was little to nothing to eat, farmers would harvest the green tomatoes before they ripened and fry them up. I don’t have a farm, but thankfully, you can purchase green tomatoes at Farmers Markets and in most produce sections of the grocery store. 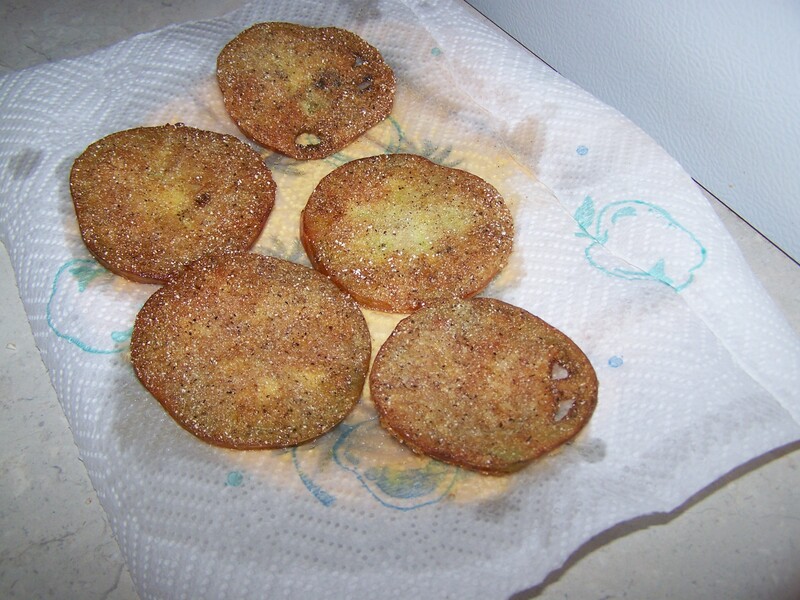 I prefer my Fried Green Tomatoes crunchy, so I like to slice them thin, but it’s personal preference. My mom prefers hers on the thicker side. 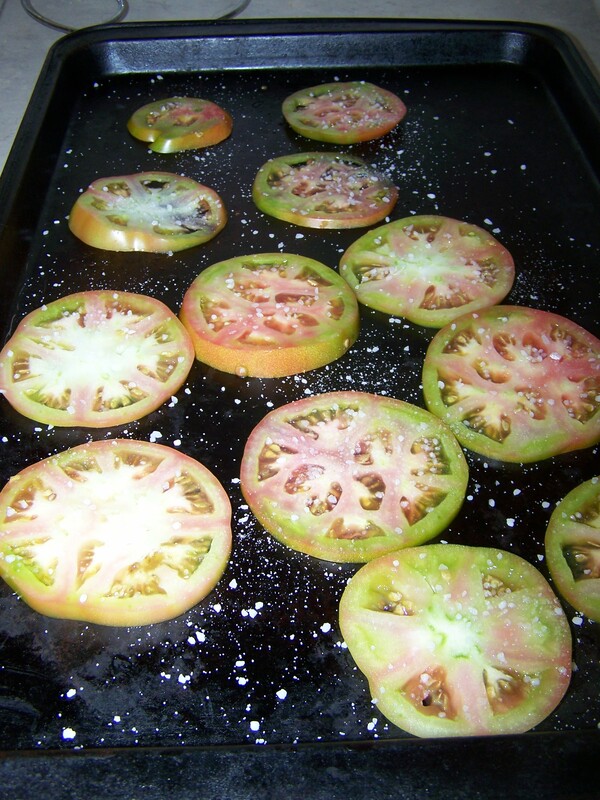 Once your tomatoes are sliced, you’ll want to lay them on a baking sheet and salt them well. I used kosher salt because the pebbles are bigger and it really brings out the flavor. 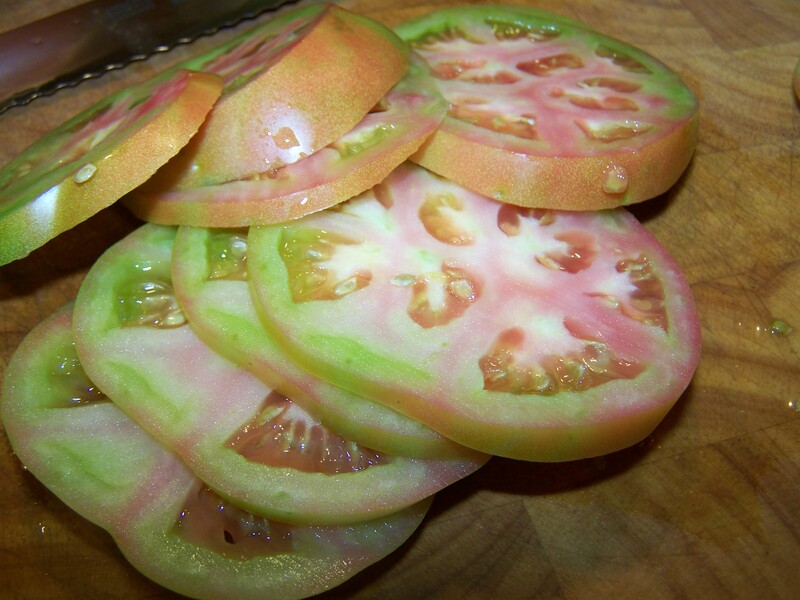 The salt also will draw the moisture out of the tomatoes. I took this tip from Paula Deen. Put your salted tomatoes in a colander in the sink and allow them to drain for about 30 minutes before cooking. There’s nothing worse than a soggy, fried…anything. My Great Aunt had 1 brother and 2 sisters, and recently shared with me that my Great-Grandmother would fix fried green tomatoes in a cast iron skillet, using cornmeal ground from fresh corn on the family farm in the 1950s. These are the stories that make a recipe rich. I used equal parts cornmeal and self-rising flour, then seasoned the mixture with 2 tsp of Old Bay and a healthy dash of black pepper. I’ve seen many variations of the recipe, but no buttermilk is needed! After the tomato is coated good on each side, shake off any excess before dropping it into the hot vegetable oil. 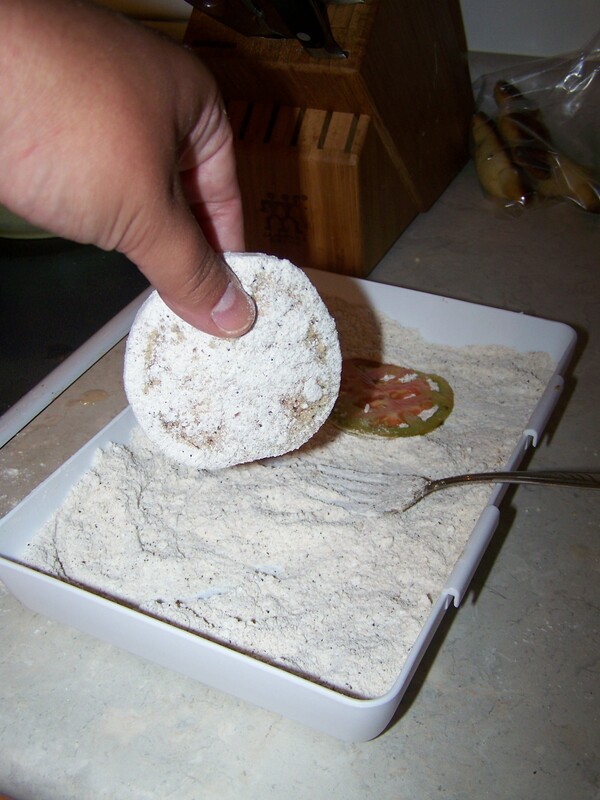 Be sure to roll the sides of the tomato in the flour mixture too, for a nice, even coating. …then remove and drain on paper towels. This was my first time making the lowcountry dish, and I gotta tell ya, it wasn’t hard at all. Look how pretty they turned out! Serve them hot. My favorite way to eat a Fried Green Tomato is on a BLT (bacon, lettuce and tomato) sandwich. Now, there’s a way to elevate a classic to the next level. 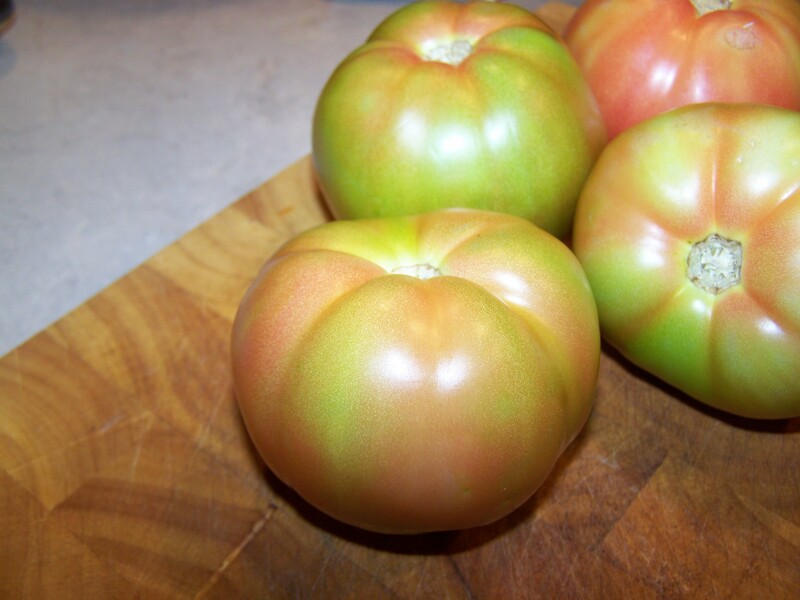 What’s your take on the Fried Green Tomato? Love it? Hate it? Tell me how you like them! Is there a certain sauce you enjoy eating with them? I asked two of my favorite chefs to recommend a sauce, and one recommends a goat cheese basil sauce and the other, a zesty citrus remoulade. I’m looking forward to experimenting. Slice tomatoes about ¼ of an inch thick. Place them on a flat surface and season with salt. 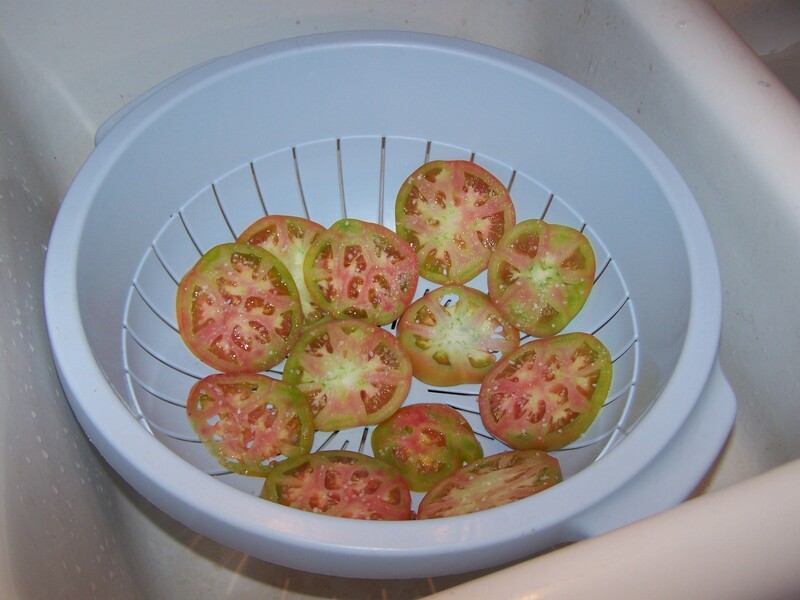 Transfer the tomatoes to a colander and allow them to drain in the sink for at least 30 minutes. Meanwhile, fill a cast iron skillet or 10-inch frying pan with vegetable oil halfway full and set over medium heat. 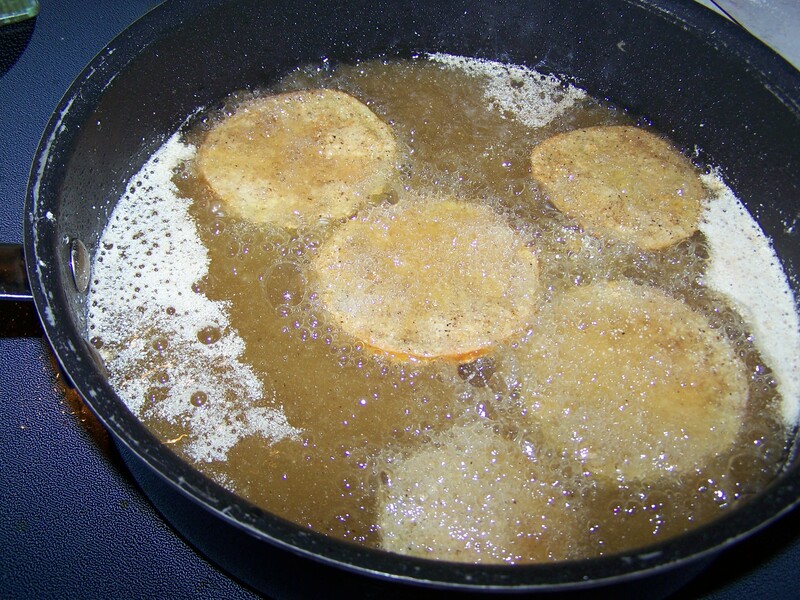 The oil will be ready for frying when sizzling occurs after gently sprinkled with water. In a small dish, use a fork to combine the cornmeal, flour, Old Bay, salt and pepper. Dredge the tomatoes in the flour mixture on each side. 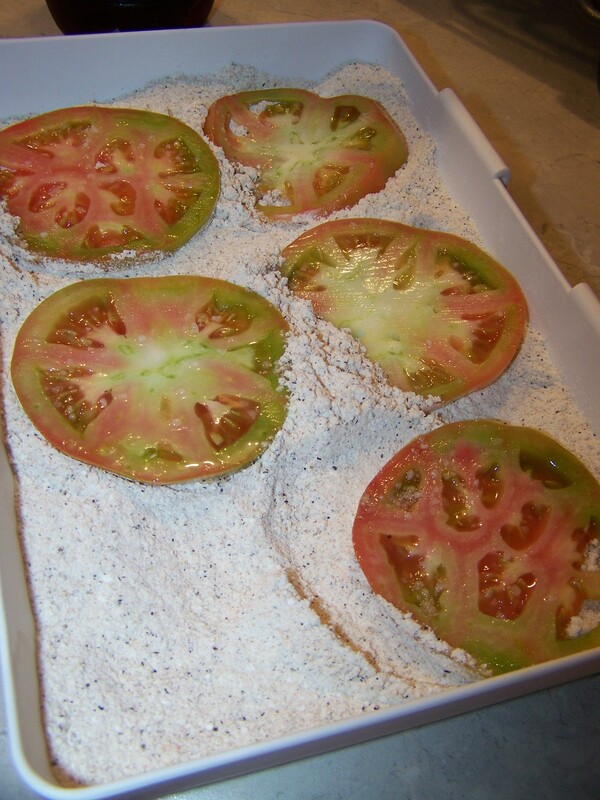 Roll the sides of the tomato in the flour mixture too, to ensure an even coating. Shake off any excess before dropping the tomato slices into the hot oil. Fry the tomato slices until golden brown, turning once during cooking. Remove them from the oil and drain on paper towels. Garnish with green onion. Serve warm with Ranch Dressing if desired. 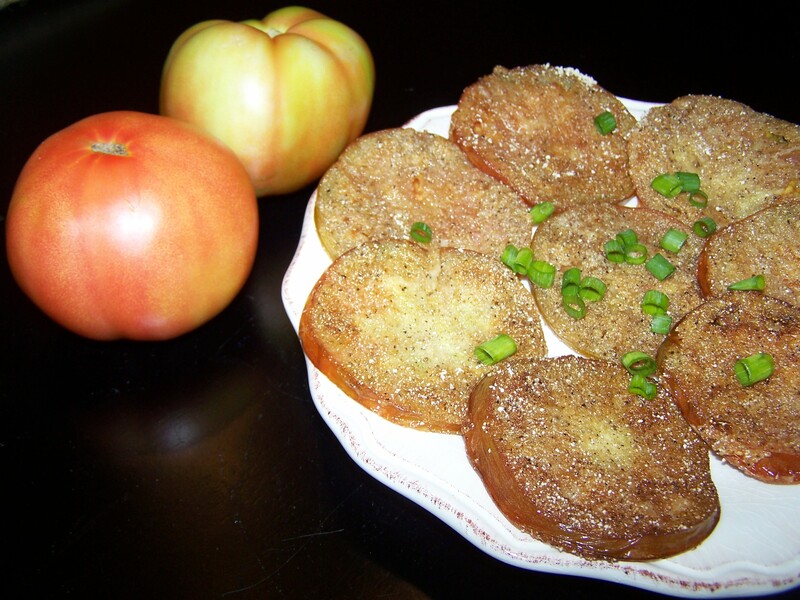 Watch me cook this recipe of fried green tomatoes on an episode of Statesboro Cooks! Wow! these looks absolutely yum! I am going to try this one. Thanks for sharing! Thank you Vivian. I hope you will! They are surely delicious. Your tomatoes looked delicious! I am sure you will make these again for your Mom when I come to visit!! I think a good dip for them would be ranch dressing. Yum. I will definitely make them again Mama! When are you coming? 🙂 Ranch would be simple, probably not a bad idea. These look sooooo good!!! 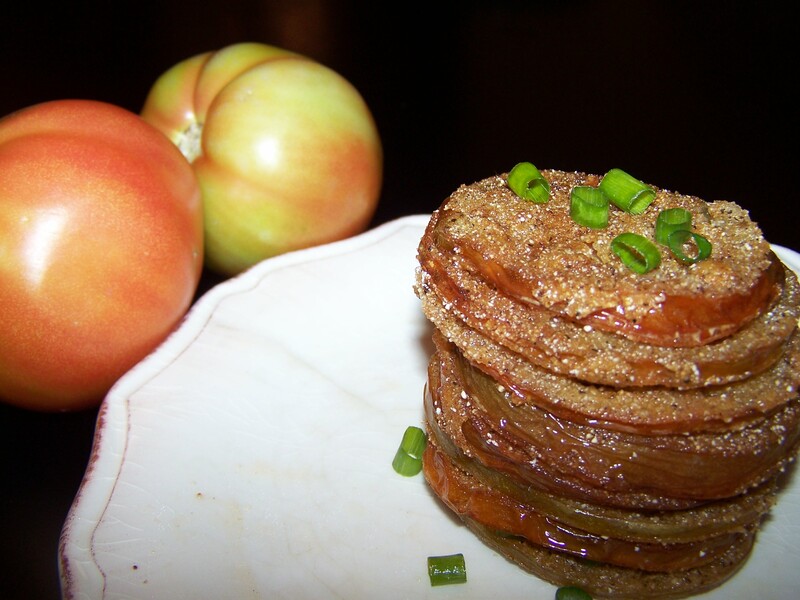 My grandma used to make fried green tomatoes for dinner with fried eggplant. That was the whole meal. One of my favorite memories of her! Thanks Ritz! Yum! I think everybody’s grandma must’ve cooked fried green tomatoes at some point. LOL.